There are exceptions, but so much of the MSM is corrupt, but in their minds they don’t think of it as corruption, because they’re “fighting for justice,’ which is more important than the truth. They don’t give a damn about the truth. The X-axis shows how liberal or conservative a respondent is, while the Y-axis gives the number at each level. 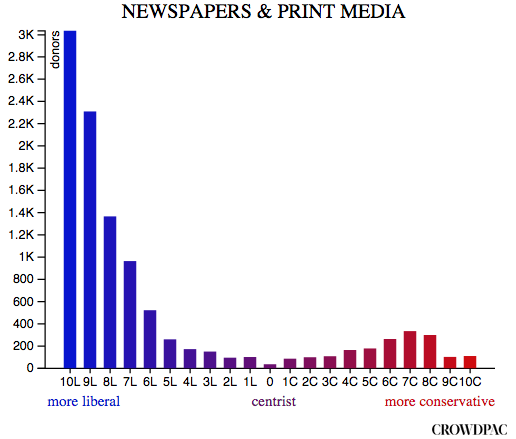 Not only does print journalism skew Left, but the vast majority of the industry’s liberal members fall into the three most-liberal grades. This is not a healthy situation, just as it wouldn’t be if the vast majority of journalists leaned Right. When news media is so skewed in one direction, it loses any sense of other perspectives or opinions on important issues, or even what qualifies as an “important issue.” And this limited perspective is transmitted to its audience, which winds up being under- or misinformed. Or they dismiss the MSM altogether, having realized thanks to alternative media that there is so much they aren’t being told, if not outright mislead about. And that isn’t healthy for the print media, as their crashing circulation numbers attest. This speaks to a media driven by an agenda, one formed by a self-reinforcing ideological monoculture — the fabled “echo chamber.” But the health of the Republic depends on an honest news media that contains a wide range of viewpoints, one that makes intellectual diversity a higher priority than that of skin color or gender. *hat-tip for the chart and BI article, by the way. It was recently announced that Congressman Trey Gowdy (R -SC), a former state and federal prosecutor, would be heading up the forthcoming House Select Committee on the Benghazi massacre. Quite a few of us have been cheering his selection, because, since the massacre, he has shown himself to be a master of the issues at stake and a dogged questioner, unlike most of the so-called press. Let’s hope, for the sake of an honest media, that at least some in the audience were red-faced at receiving this needed lesson. You are currently browsing the archives for the News Reporting category.